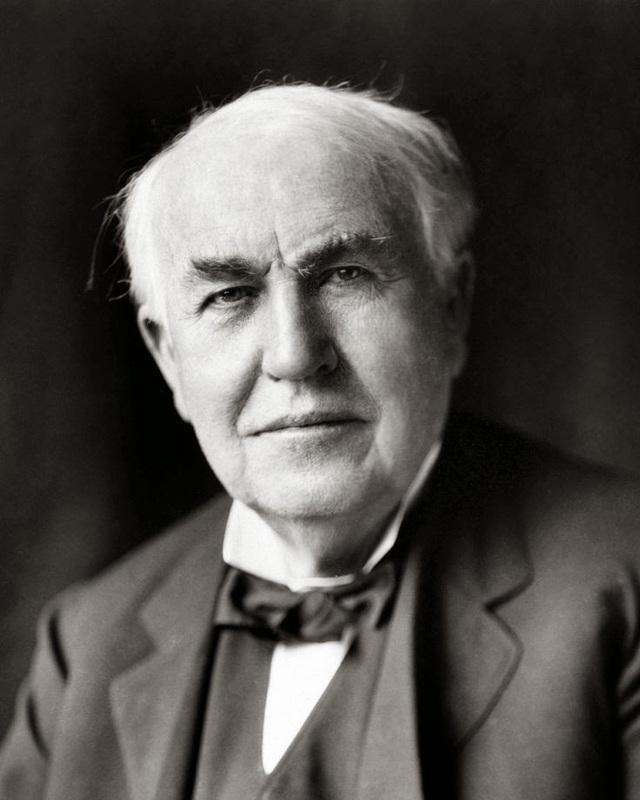 Thomas Alva Edison, inventor of the motion picture camera. When discussing the origins of the film industry, the best place to start is the invention of the equipment that made the entire industry possible. Thomas Edison was a humble telegraph operator who made it big. His telegraphy work taught him the basics of electricity, which led to his invention of the stock ticker and then the sound recording and reproducing phonograph (1878). Then came the "Kinetograph" (motion picture camera). W.K.L. Dickson worked on it with him, and Dickson probably did most of the work, but Edison financed it all and was the one with the inspiration to move forward with the project. This led to the Kinetoscope (1891), or penny arcade viewer. This led to the motion picture industry and what we now know as the Birth of Hollywood. Edison's factory then produced the Vitascope for Thomas Armat, which dazzled audiences in New York City (1896). There were also some movies around this time that had sound, cylinder recordings synchronized to the images. The kinetoscope made its way to London, Paris, Italy and The Netherlands in 1894/1895. In Germany and Austria-Hungary, a separate company (Deutsche-österreichische-Edison-Kinetoscop Gesellschaft, founded by the Ludwig Stollwerck) handled distribution. While Edison continued developing his equipment, his work was superseded by others who built on his invention. In 1908, Edison started the Motion Picture Patents Company, a conglomerate of nine major film studios (commonly known as the Edison Trust). Unfortunately, this was found to be guilty of antitrust laws, and the company was dissolved by court order in 1915. Fittingly, Edison became the first honorary fellow of the Acoustical Society of America, which was founded in 1929. This organization remains in existence, though it was merged with three other scientific societies in 1931 to form the American Institute of Physics. Edison was careful to preserve his early work by giving the US Copyright Office strips of photographic paper with prints of his films. Many of these survived only in this fashion. Around 1900, when cinema was new and exciting. 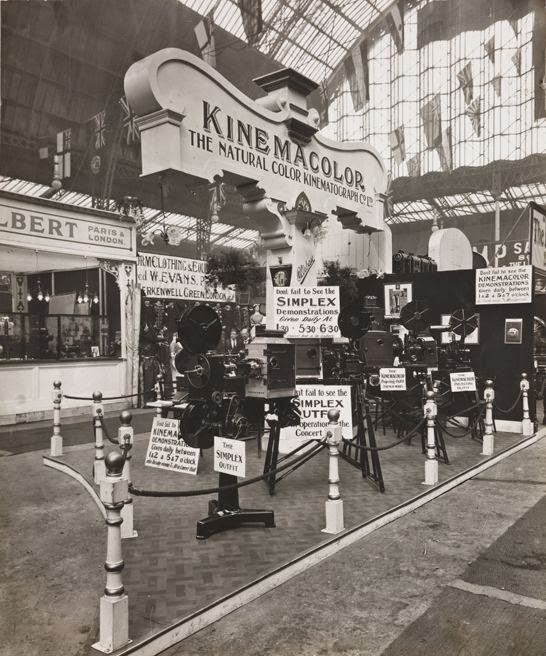 Kinemacolor was an early color motion picture process. Used commercially from 1908 to 1914, it was invented by George Albert Smith of Brighton, England in 1906. It took its name, Kinemacolor, in 1909. It was a two-color additive color process, photographing and projecting a black-and-white film behind alternating red and green filters. It was an expensive process that never really panned out, but it did serve as the basis for a handful of dramatic short films in 1912-1914. It served as a major footnote to Hollywood history because its studio was bought by D.W. Griffith. Griffith found that the studio had been planning to make a film of Thomas Dixon's novel "The Clansman." Liking the idea, Griffith continued the project, changed the name to "The Birth of a Nation," and released the controversial film in 1915 to widespread acclaim. The fields of Hollywood before the film industry moved in. The Biograph Company had derived from Thomas Edison's fellow inventor William Kennedy Dickson in 1895, and the company was known as the American Mutoscope Company (incorporated in New Jersey) from 1895 to 1899, then as the American Mutoscope and Biograph Company, and in 1909 simply as the Biograph Company. "Biograph" was the name of a successful early projector. The studios prior to the move to Hollywood in 1910 were located first at 841 Broadway at 13th Street in Manhattan, then in 1906 at 11 East 14th Street near Union Square. The company retained quarters at 175th Street in the Bronx for years after that. D. W. Griffith and other Biograph actors went to Los Angeles in 1910 to shoot "Ramona" on location. While there, they also scouted the area as a possible new location for the company. They heard about a pretty spot just to the north called Hollywood, saw it, loved it, when they went back to NYC, they told everyone about it. Biograph opened a studio in LA on Pico and Georgia Streets in 1911. Other film companies, hearing about the pretty little town called Hollywood, soon followed. 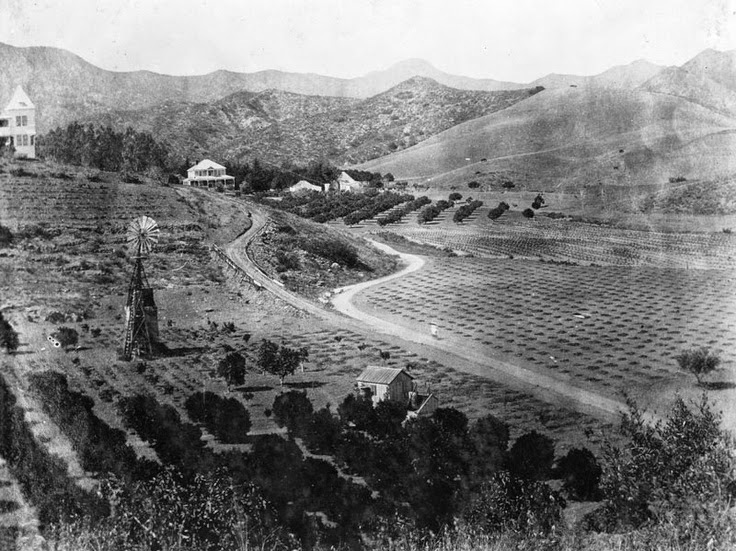 Founded in 1853, Hollywood was a simple farming county at the turn of the century. Named by H.J. Whitley, a real estate speculator now known as the "Father of Hollywood," it merged with the City of Los Angeles in 1910. Some film-makers from New York City headed west about this time, and D. W. Griffith filmed the first motion picture there, "In Old California," that same year for the Biograph Company. Biograph was part of Edison's trust from 1908 until its dissolution in 1915. The company fell behind in technology, using a non-standard film, and Griffith left the company when he bought Kinemacolor. Biograph then stopped making its own films, and it eventually was broken up and bought in pieces by others. The Bronx studio burned down in 1980. Selig Polyscope Studios. That is an incredibly luxurious car for those days. 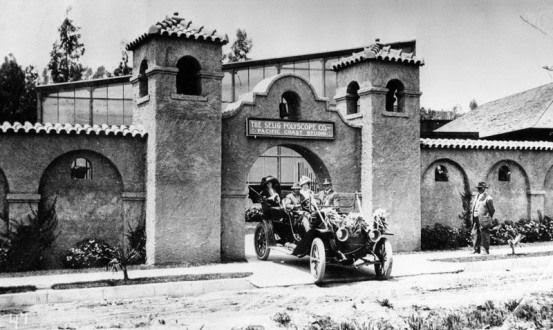 In 1909 Col. William Selig built the very first movie studio in Los Angeles, Selig Polyscope Studios, at 3800 Mission Rd. in Echo Park. He also started a zoo next door, aptly named Selig Zoo, mainly to supply the animals needed for his jungle pictures, but it was also open to the public. Selig Polyscope went bankrupt in 1918, and the facility then became Louis B. Mayer Pictures. Selig Zoo, however, stayed in business for 25 more years. 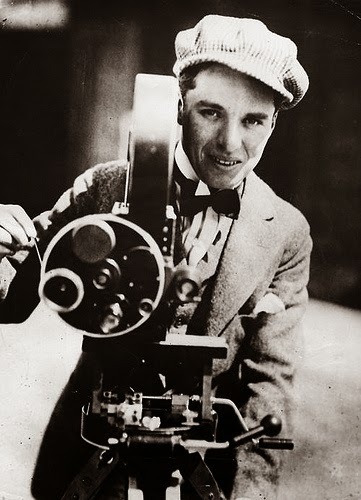 The Mabel Normand Film Company: Silent slapstick filmmaker Mack Sennett moved to Los Angeles in 1913, setting up shop in what is now Echo Park, and began to make short movies starring an upstart comedian named Charlie Chaplin. Three years later, he built a set of soundstages to make movies with his movie star girlfriend, Mabel Normand. 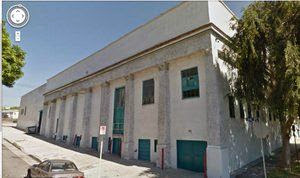 Now those Silver Lake soundstages, which became part of the Mack Sennett Studios, are getting a face-lift under new owners. Mack Sennett's studio. All those cars would be worth a fortune now! Mack Sennett was at times known as the "King of Comedy" in early Hollywood. He worked with many actors, including Charlie Chaplin, Gloria Swanson & Bing Crosby. In 1914 he formed the Keystone Co., which produced "Tillie's Punctured Romance," the first American feature-length comedy. In 1932 he won an Academy Award for a short called "Wrestling Swordfish," and in 1937 he received an Academy Honorary Award. However, the Great Depression hit his business hard and he went into bankruptcy in 1933. 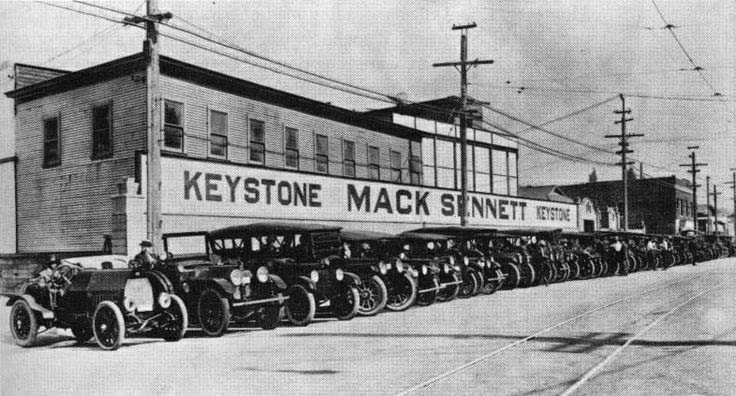 The Mack Sennett Studio in 1916. Not very imposing, but those were early days. 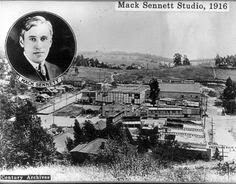 Mack Sennett Studios was built as a silent movie studio in 1916 by legendary producer Mack Sennett. This Los Angeles landmark has played host to countless productions, over the past 100 years, including iconic clients such as Bing Crosby, Universal Pictures, Adidas, Nordstrom, Halston, Miramax, Dr. Dre, BBC, Martin Scorsese, Leonardo DiCaprio, Mitsubishi, Pharrell Williams, Justin Bieber, Beats by Dre, David Lynch, among others have graced these well-known stages. Keystone Studios. Very dingy and threadbare, a far cry from today's Hollywood. 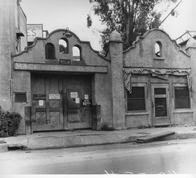 The old Keystone Studios in Edendale - 1926. Home of the famed Keystone Cops comedies. This is where Charlie Chaplin got his start. 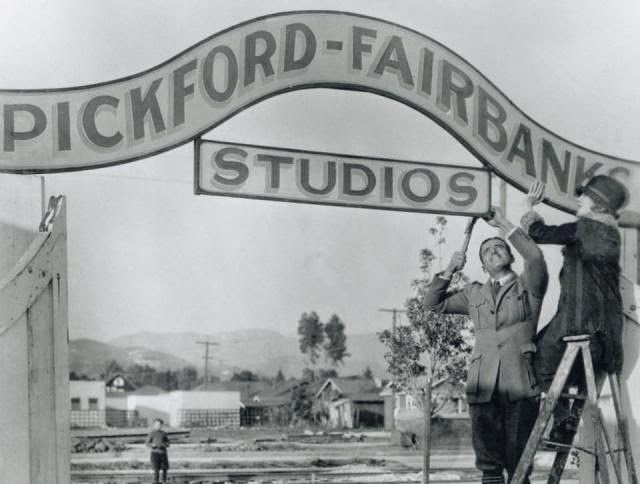 Pickford-Fairbanks Studios. This was the birth of United Artists, recently owned in part by Tom Cruise, and more recently by MGM. Mary Pickford and Douglas Fairbanks hoist their shingles at the new Pickford-Fairbanks Studios (later renamed United Artists). Classics such as Robin Hood (1922); Wuthering Heights; Some Like it Hot; Guys and Dolls; West Side Story and countless others were shot here. 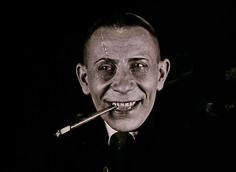 Erich von Stroheim in "Blind Husbands" (1919). Erich von Stroheim was born in Austria and emigrated to the United States via Ellis Island in 1909. He began in 1914 as an actor, but quickly turned to directing, where he achieved his greatest success. He worked on "Intolerance" (1916) and "Greed" (1924). However, somewhat ironically, he is perhaps best remembered today for acting in the 1950 classic Billy Wilder film "Sunset Boulevard" in an autobiographical part as an ageing, washed up director. He was nominated for an Academy Award for that performance. 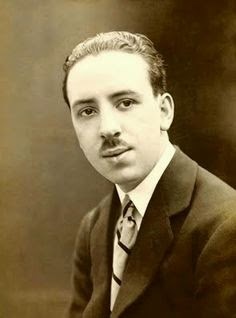 Young Alfred Hitchcock during the silent film era. Rejected for British military service during World War I due to his weight, Englishman Alfred Hitchcock was looking for something to do. He began writing, publishing various short stories. This led to work on films, where he began as a title card designer for the London branch of the future Paramount pictures in 1920. He soon took a full-time position at Islington Studios, did some work in Germany, made some poorly received films that are now lost, but finally found success with 1926's "The Lodger: A Story of the London Fog" about a Jack the Ripper-type killer. His fame grew from there, and he transferred to Hollywood to work for David O. Selznick in 1939. 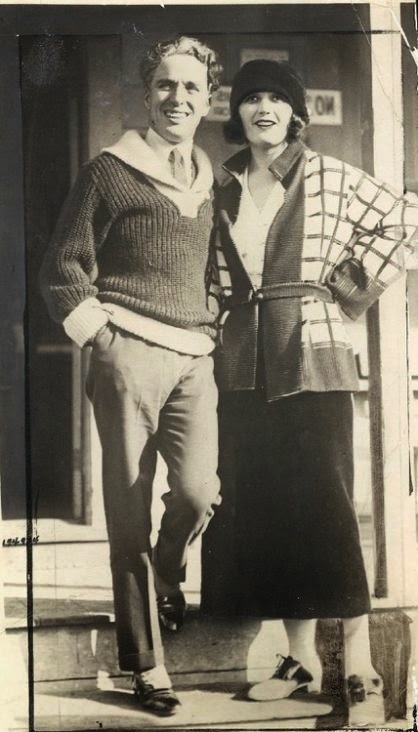 Charlie Chaplin and Pola Negri, 1932. The Great Depression largely bypassed the top Hollywood stars like these two. Charlie Chaplin was born in South London in 1889. His parents were music hall entertainers. He began performing on stage and had dropped out of school by age 13. He was going on tour for various English companies in the early 1900s, and in 1910 they toured America. The States excited Chaplin, and he came back for a second tour in 1912. He received an offer to join the New York Motion Picture Company in 1913. Though he did not like the "crude" work, he wanted to stay in America, so he signed on. 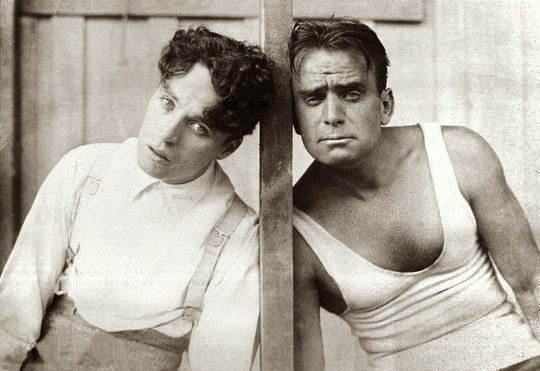 Charlie Chaplin and Douglas Fairbanks, 1918. Mack Sennett brought him to Los Angeles in late 1913. Film roles soon followed, and he directed his first movie in 1914. He moved to Essanay Film Manufacturing Company in late 1914, and there he developed his "Tramp" character. With "The Tramp" in 1915, Chaplin broke through with audiences. He was still a very young man. 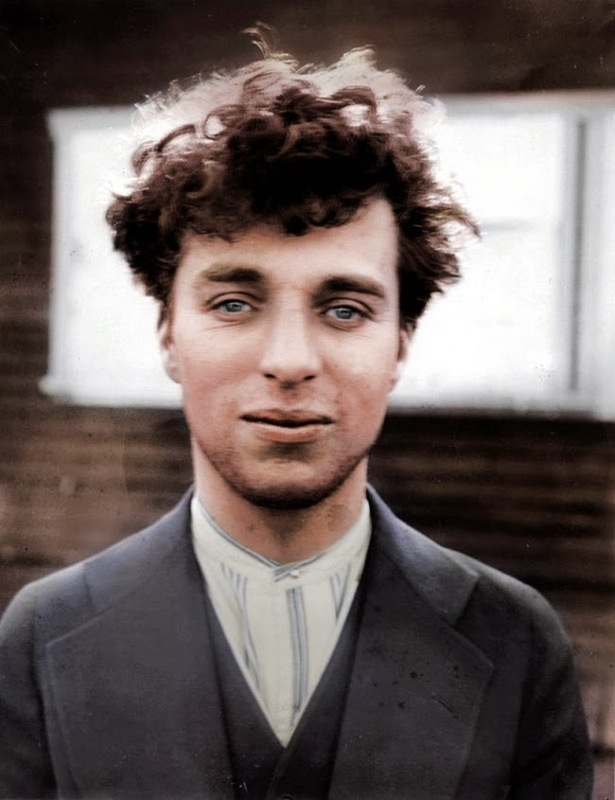 Charlie Chaplin at 27 years old in 1916. He later moved to Mutual Film Corporation, and he became one of the highest paid people in the world. The auteur Charlie Chaplin at work. Chaplin directed as well as acted in his films. His character zoomed higher, and he was honored for his early film contributions at the Academy Awards in 1972. He received a 12-minute standing ovation, the longest in Academy history. 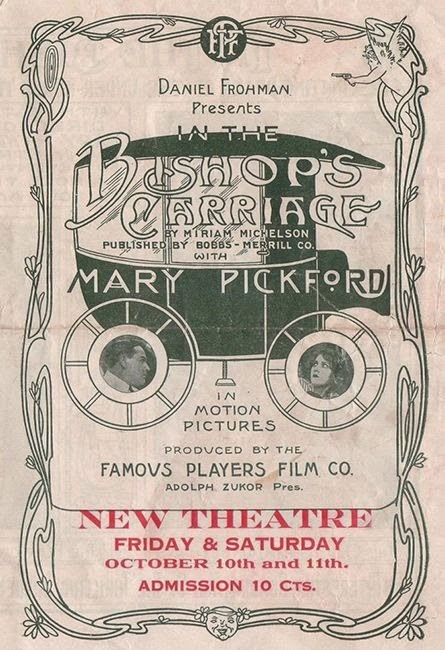 An early Mary Pickford film poster. Animation has been around since the dawn of film-making, and, despite his larger-than-life legend, Walt Disney was not the first animator. Los Angeles and nearby Hollywood saw their first film studios open in 1909-1911, and Winsor McCay produced his first animated film there in April 1911. Some of McCay's work survives, but not much. His first efforts were little more than pencil drawings, with extended repetition to give the audience time to keep up with the (for those times) fast-paced proceedings. "How a Mosquito Operates" (1912) is a good example of McCay's earliest work. Animation may be considered cutting edge technology in the film industry now, but it was at the forefront of the film industry 100 years ago, too. McCay soon graduated to feature-length films. Let's look at one of Winsor McCay's feature films. This is a true oddity, animation from 1921 called "The Centaurs" which is quite creepy and odd. Winsor McCay was a cartoonist in the early part of the century, around the time that Bud Fisher was making "Mutt and Jeff" a national phenomenon. McCay beat Fisher to the big screen, getting his "Gertie the Dinosaur" animation film up in 1914 while Fisher did not get his first Mutt and Jeff film produced until two years later. Advertising for McCay's animated films called him the "the originator and inventor of Animated Cartoons," which wasn't quite true but was close enough for government work. Almost all films from those days are lost due to the degradation over time of film stock and destructive fires caused by that same disintegrating film. Only a fragment survives of this animated film which looks quite interesting and advanced for its day, "The Centaurs." It was among the last of McCay's ten animated films and may never have been shown to audiences. That may have been a good thing, too, considering how weird it is. 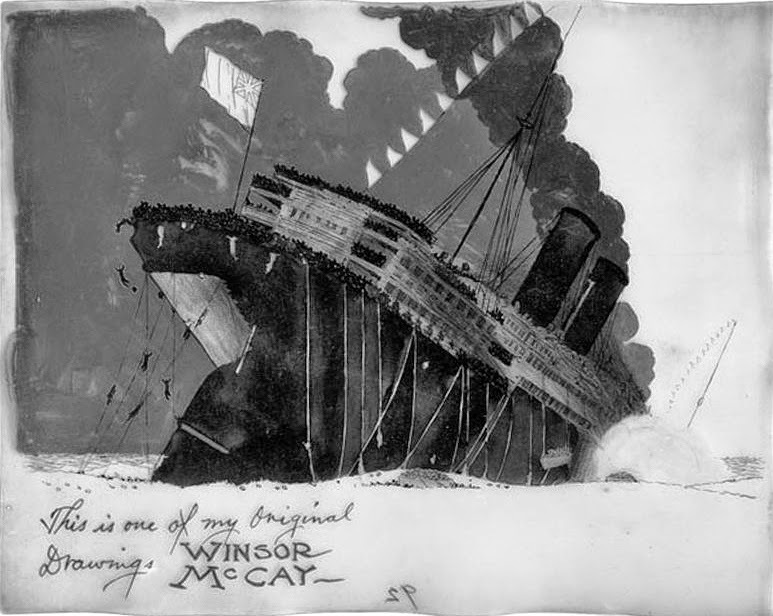 McCay used a form of rotoscoping to create these scenes. Still, McCay was at the cutting edge of animation of his time, pioneering layering and the use of cels themselves, processes invented while he was making films. His very first film in 1911, "Little Nemo," was a combination of animation and live action, an art form that has recently experienced a huge resurgence in popularity. He also was the first to color in his frames, introducing true color to the cinema for the first time. "The Sinking of the Lusitania" was a major animated feature film that took two years to make. Unfortunately for the studio, by the time it was finished and released to the public, World War 1 was almost over and the country had moved on to other things. 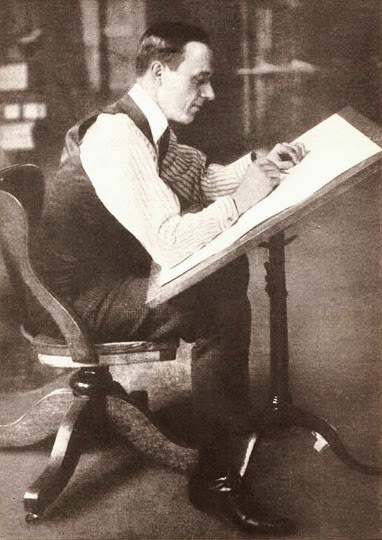 The fact that McCay worked in vaudeville and showed his films there helped him to develop audience-friendly techniques. It was largely only a matter of timing and opportunity that gave Walt Disney a chance to become a world-famous film-maker and consigned Winsor McCay to utter obscurity. Another early pioneer of animation was Bud Fisher. He was the man behind "Mutt and Jeff." 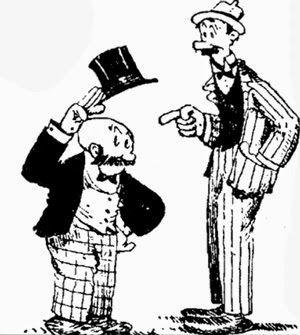 The Mutt and Jeff cartoons were a key part of the establishment of Hollywood as a leading film center. If you thought that Walt Disney invented animation, you are incorrect. Animation actually goes back further even than Mutt and Jeff, but this series was one of the early breakout successes for the field. The "Mutt and Jeff" cartoons became an expression for the pairing of short and tall people. People still vaguely understand the expression, but the source of it is long gone. Except, it isn't, because it is right here. The phrase is also, in a larger sense, a term used to describe the pairing of opposites of any sort - happy and sad, or athletic and wimpy, whatever. In "The Flintstones," for instance, Fred is big and gruff, while Barney is short and thoughtful - a true "Mutt and Jeff" pairing. When people say that opposites attract, they are talking about a Mutt and Jeff situation. Mutt and Jeff were the brainchild of Bud Fisher. Probably not a name you've ever heard of, but back in the day there was nobody bigger in the field. Harry Conway “Bud” Fisher began the first comic strip, "Mutt and Jeff," in 1907. It stuck around for 75 years, which isn't bad at all. Augustus J. Mutt was a gambler, introduced not long after the comic strip began. He caught the public's imagination, so he stuck around. About a year later he met Edgar Horace Jeffries, who was short and dimwitted. And thus was born comedy gold. Animation in movies began to take off in the early 'teens, too. Since Mutt and Jeff were big hits in the "funny pages," filmmakers figured they would work on the screen as well as on the printed page. In 1916, Fisher worked a deal with with Charles Bowers and Raoul Barre’ to make some animations. They opened up Bray Studio, and their animations were successful for a decade. Then things changed. Sound films took over, and Fisher's entire catalogue of silent animations became pretty much worthless. Exhibitors simply wouldn't show them. His rivals such as Paul Terry ("Mighty Mouse"), a talented former colleague, had come up with newer material. Fisher didn't. Walt Disney came out with "Steamboat Willy" and brought Mickey Mouse to life with synchronized sound. That was the end for Bud Fisher and his classic silent creations, Mutt and Jeff. Bud never was able to work another deal for Mutt and Jeff, though he had some opportunities. Fisher made various attempts to use his old animations by adding color and soundtracks to them, but their time had passed. Bud Fisher paved the way for countless others, including Walt Disney, but he's completely forgotten today. However, back in the day, Bud Fisher was big time. The impact of animation continues to grow with time, and it is all due to the efforts of these pioneers of animation. 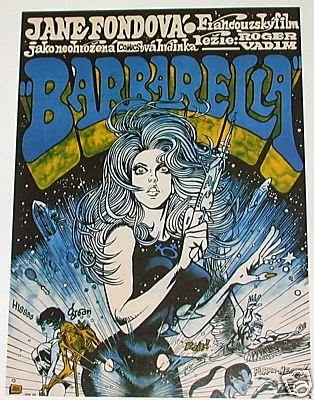 Vintage Film Posters of Jane Fonda in "Barbarella"
On the theory that too much "Barbarella" starring Jane Fonda and directed by her then-husband Roger Vadim is never enough, here are some foreign-market posters. They offer stunning artwork not seen in the United States or, for that matter, anywhere else beyond their intended markets. For many more "Barbarella" (1968) pictures of the lovely Lady Jane Fonda in her space outfit, go here. Among other things, these posters represent the height of the pop-art craze and really reflect the state of cutting edge art as of 1968. Whatever else you may feel about Jane Fonda - and we all know how that goes with many, many people due to her anti-war activities - you perhaps will admit that she was stunningly beautiful in her prime. 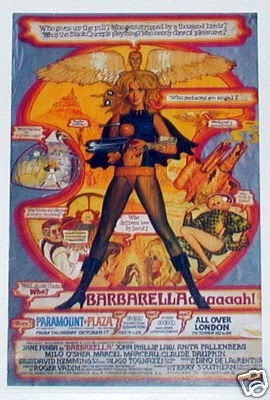 Jane Fonda, incidentally, has good memories of "Barbarella" and has said fairly recently that she considers it a "fun" film - which it definitely is.